They crucified Jesus on a Friday. I imagine the world grew dark and cold as His mother mourned the loss of her Precious Son. Oh the tears she shed as this mother’s heart was shattered. 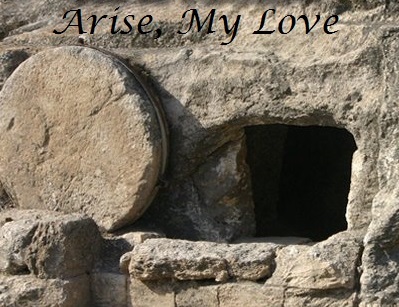 On that third day, the stone rolled away from the tomb as God whispered, “Arise, My Love,” and Jesus arose from the dead! Praise God Almighty, it’s resurrection day! sitting on the right side, and they were alarmed. 6 “Don’t be alarmed,” he said. “You are looking for Jesus the Nazarene, who was crucified. It is my hope that today, Easter Sunday, you gather with your family and friends to celebrate the TRUE meaning of Easter. It isn’t about bunny rabbits or hiding pastel colored Easter eggs filled with candy. It is all about how Jesus laid down His life willingly for you and for me. Jesus wasn’t held on that old rugged cross by those nails that pierced His skin. Jesus could have come down at any moment if He so chose, but His love for us all is what kept Him on that cross. Jesus loved us so much that he laid down His life for us. Think about that for a minute. He died so that we may LIVE eternally. All we have to do is confess our sins, ask forgiveness, turn from our sinful ways, and ask Jesus to come into our hearts. I pray that you’ve had that conversation with Jesus. If you haven’t, would you please right where you sit reading this … have a little talk with Jesus and invite Him into your heart. NO matter what you’ve done in the past, He will forgive you if you only ask. Nothing you could have ever done in your past would prevent Jesus from loving you. There is NO condemnation in Christ. NONE. So what are you waiting for? Say a simple, yet life changing prayer, asking Jesus to come into your heart and into your life as we celebrate the resurrection of Jesus Christ. It’s Friday. The day Jesus was beaten and tortured as He walked through the streets. People gathered around to watch the show as others insulted Him. They lashed out at Him verbally and physically as well. He was beaten and bruised. His body was pierced, and His skin was torn. He stumbled and fell to His knees on several occasions, I imagine, as He continued to carry His own cross on His journey. They took our precious Jesus, and they nailed Him to the cross. They drove heavy nails into His hands and feet. They mocked Him as they called Him “King” and placed a crown of thorns upon His head. He moaned in pain. He cried out. 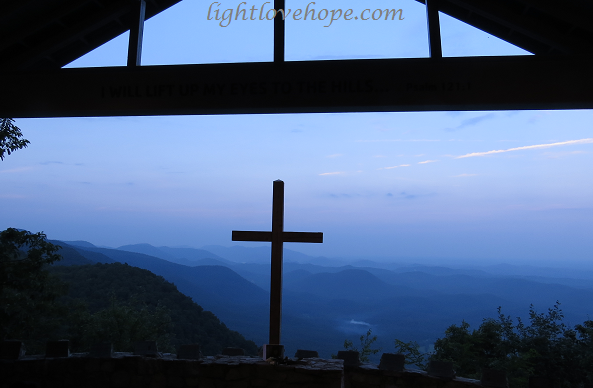 They lifted Him up on the old rugged cross and placed Him between two thieves. Our Jesus, our King, our Messiah. The Son of God! There my Jesus said, “It is finished,” as He took His last breath. The earth shook, thunder roared, and lightning flashed across the sky. They crucified Jesus as His mother watched in horror, her body consumed with grief. She cried at the foot of the cross as He hung there, lifeless. They took His body and placed it in a tomb. They rolled a stone in front and had guards patrolling. They buried my Jesus on a Friday. Jesus died such a cruel death on the cross. He suffered in agony for all of our sins. This beautiful, perfect man that had done no wrong was beat until He was bloody, then nailed to the cross. He hung there with nails in His hands and feet with a crown of thorns on His head. His mother, Mary, watched in horror and cried so many tears that day. There on Calvary, Jesus died for you and for me. His lifeless body was taken down from the cross and prepared for burial. They performed the rituals before placing the body of Jesus Christ in the tomb. They rolled a stone in place and had guards standing guard. Ah, but the grave could not hold THE KING! On the third day, God whispered to His Son … “Arise, My Love” ... and Jesus arose from the dead! Praise GOD, Jesus arose, just as He said He would! This morning my youngest daughter flung open the door to my bedroom as she ran to plop down on my bed. With her sparkling blue eyes looking up at me, she smiled and put her arm around my shoulder. I kissed her forehead, and then I asked if she knew what this day was all about. Yes, it is Easter, but it is so much more than Easter bunnies, candy, and searching for brightly colored eggs. Thankfully, she already knew this, but I felt in that moment that I needed to tell her the Easter story to be sure that she knew, without a shadow of a doubt! And she did! I am so proud to know that my daughter knows what Easter truly is about, but not only that, she has asked Jesus into her heart. She has accepted the gift of eternal life through Jesus! I want us to be here on this earth for a very long time, and I pray that God allows us to live long, healthy lives together. When our time comes, we have the assurance that while we may not see each other for a while, we will be reunited in Heaven. We have lost loved ones in the past – my sister, my granddaddy, and then my grandma – but I know that I will see them again one sweet day all because of what Jesus did on the cross. He died so that we may have eternal life through Him. 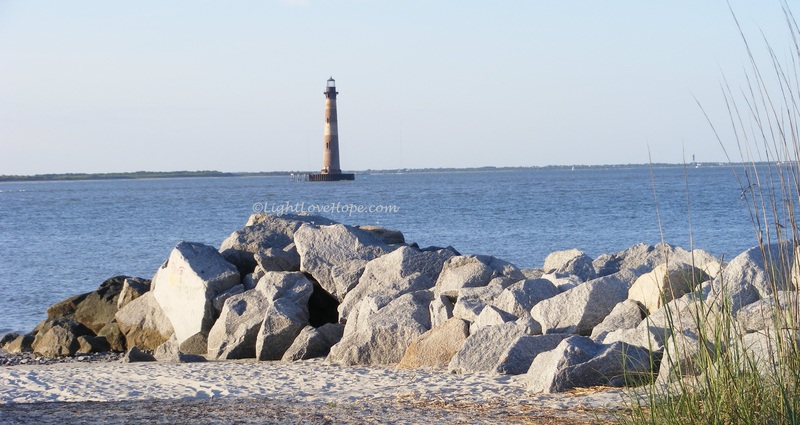 And I thank Him … oh, how I thank Him! It is my hope that while people are enjoying this day off from work and school that they will stop to consider exactly what happened on this day. Today is Good Friday. It is the day that Jesus died on the cross for all of our sins. Jesus was sinless, yet He bore all of our sins on the cross. He endured so much pain and suffering as He was beaten, battered, and bruised. He was mocked and humiliated. He was crucified and hung on the old rugged cross where He died for you and for me. “It is finished,” Jesus said, and the whole world turned dark as Jesus breathed His last breath. Ah, but Sunday is coming! Can you imagine having a love so deep, so strong, so unconditional to DIE such a cruel death for sins that you did not commit? That’s how much Jesus loves us. He bore it all so that we may have eternal life if we only believe in Him and ask Him into our hearts. Have you honestly and truly accepted Jesus as your Lord and Savior? Have you confessed that He is Lord of your life and allowed Him to come into your heart? If you haven’t … please do so today. Please … I beg you. I want you to know Jesus and have the gift of eternal life also. This is not the end. Yes, Jesus died on the cross on Good Friday. We are taught this, and we know this going through life. Jesus sees us all. He knows us inside and out. God made us with His own hands, and He knows the number of hairs we have on our heads. He knows things about us that sometimes we wish He didn’t know and didn’t see. How did we learn this, though? We were taught this as small children growing up in the church. This was instilled in is. As we grew more mature and into adulthood, we understood that Jesus wants a personal relationship with us. Yes, we are to come to Him to ask for forgiveness, which He will grant if we are sincere, repent, and turn away from our sins. If we believe in Him, confess Him as Lord and Savior, Jesus comes to live inside of our hearts, and we are promised the gift of eternal life through Him. Jesus died on the cross for you and for me. Some times, though, it is hard for little children to grasp the entire concept of Jesus, an invisible man that they are told to trust that watches over them. We have faith although we cannot see Jesus walking the earth. We know He is in Heaven, and we are to trust in Him and believe in Him. We have faith in someone we have never seen before, but we can feel His presence so strongly at times in our lives. I know I have! What if you had a tool to help make Jesus more real to your little ones? Do you think it would help them to grasp the concept of Jesus more easily if they had something tangible to hold on to? While I know we have crosses that we can give to our little ones to hold that represent Jesus dying on the cross to give us eternal life, I have just recently come across a Jesus Sees Me Doll. When I saw it, I knew that my daughter would love to have one. She enjoys playing with Barbie dolls and regular baby dolls, so I thought why not an actual doll that will teach her about Jesus … with none other than a Jesus doll at that?! This Jesus Sees Us Doll came with a book that my daughter could not wait to read. She held Jesus in her hands, hugged Him tight, and then sat down with Jesus to read through this book. She liked it so much that she took Jesus to school with her! 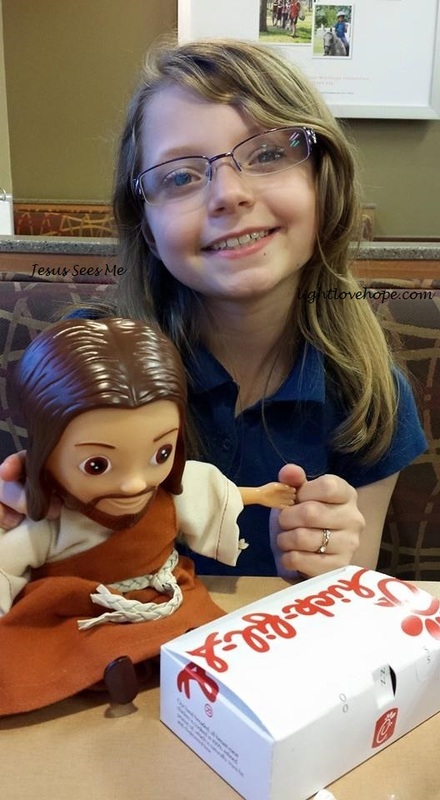 My daughter attends a Christian school and was so excited to be able to share the Jesus doll and book with her friends. How perfect right before Easter, too! The doll and book may have been invented with preschool aged children in mind, but my ten year old and her fellow classmates LOVED the concept behind it all. The teacher had never seen anything like it before either, and she really liked it as well. I think that says a lot. My daughter gets scared at night as most children do in their childhood. Whether they are afraid of the dark, despite the night light shining in their rooms, or whether they are afraid that monsters live under their beds, it brought my daughter great comfort to know that Jesus was with her. She said it helped her to feel safer. 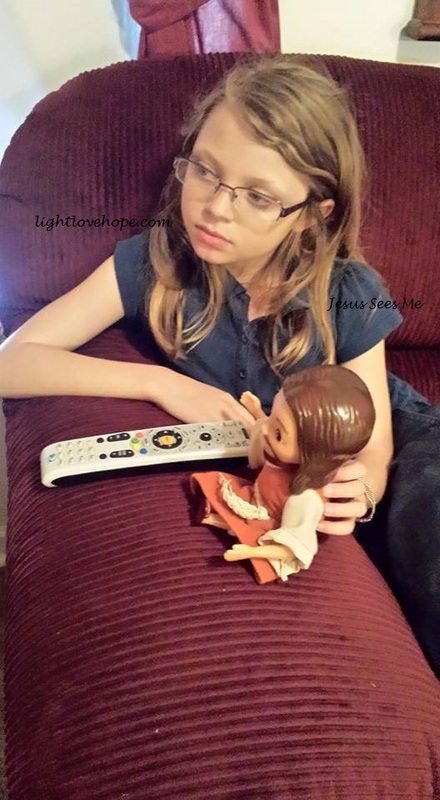 While she knows that this is just a doll and that the real Jesus is watching over her in Heaven, it did comfort her to be able to snuggle into bed with Jesus right beside her to help her have pleasant dreams. She even carried Jesus with us to Chick-Fil-A recently to eat and watched television with Jesus right beside her. She positioned Jesus just right so He could have a good view of the movie they were both watching. That was very sweet! If you are not sure what to get your children for their Easter basket this year, why not consider a Jesus Sees Me Doll? It is a tangible item that they can hold in their hands and arms to make Jesus real to them. Yes, share the stories of Jesus in the bible, and yes, make sure they know the real Jesus … but what better doll can they possibly be playing with than a Jesus doll? Think about it! For us, it was the perfect gift, and her little eyes lit right up, quickly followed by taking Jesus into her arms to give Him a big hug. The one thing my daughter did notice about this doll is that they did not have holes in His hands or feet where they nailed Him to the cross. She commented that Jesus would have scars on His hands and feet due to how He suffered on the cross for our sins. She’s right! That is the only thing I noticed about the doll, too. Other than that, the doll was perfect. His arms are outstretched welcoming your little one to embrace Jesus, and His little sandals on His feet are just precious. I enjoyed looking at the Jesus doll and reading the book myself! What a great tool to make Jesus real to your little ones! While we don’t want them to have any idols, we just have to explain to them that this doll is not the real Jesus, just like the man in the Jesus movies are not the real Jesus either. They will understand this, and it will still comfort them to have the Jesus doll by their side. They could even have this doll propped up as they kneel down beside their beds at night to say their prayers to the real Jesus in Heaven. I think this Jesus doll is a great reminder that Jesus is always with them watching over them. Consider getting your child a Jesus Sees Me doll for their Easter basket this year! A special thanks to Fly By Productions and Jesus Sees Me for a courtesy Jesus Doll. This is one of my most favorite Easter songs. The lyrics are below. Click here to view the video on Youtube. Praise God, Almighty for sending His Son to die on the cross … He rose on the third day! Jesus bore all of our sins. We have been set free and promised the gift of eternal life, if only we believe in Him. For God so loved the world that He gave His only begotten son that whosoever believeth in Him shall not perish but have eternal life. Yesterday was Friday, but not just any ole Friday. Every year we remember the greatest sacrifice of all time made on the Good Friday before Easter. 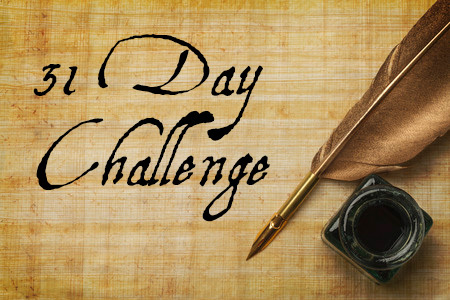 It is the day that Jesus was beaten and humiliated, completely disgraced and broken for all of our sins. It is the day that He carried His cross, the one that He would be nailed to where His suffering would continue until He died. Jesus did this ALL for us! We sat through The Passion of The Christ a few years ago. With tears streaming down our faces, we watched all of it unfold before our eyes on the screen. How we felt could never, ever come close to the way that Mary must have felt seeing her Son treated in this way and ultimately hanging on the cross in agony. It’s hard, in a way, to understand the greatest sacrifice of all time. It’s hard to grasp how God could allow His son to be beaten and die a horrible death. I know it was to forgive us all from the sins we have committed and to provide a way for us to have eternal life. It is through Jesus that we all can have eternal life if we only believe in Him and ask Him into our hearts. 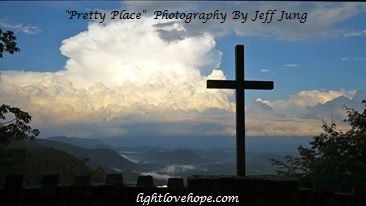 We can be assured of eternal life in Heaven with Jesus, if we only believe! I do believe. I hope you do, too. On Friday he suffered and bled. He hung on the cross, crying out in pain. He later died and was placed in a tomb. The stone was placed over the entrance of where His body was placed in the tomb. Everything was silent. I imagine that tears continued to fall as His mother mourned the loss of her precious Son, Jesus. There was such violence, such humiliation, such distress, and such pain and suffering on Friday. Then, there was silence on Saturday. Praise God, Almighty. Sunday’s coming!